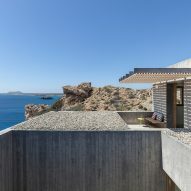 This concrete holiday home on Greek island Karpathos cantilevers over a rocky cliff and features an open-air dining area that looks out across the Aegean Sea. 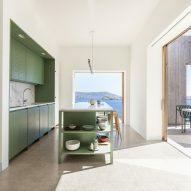 Stockholm-based architecture office OOAK designed the property for a couple living in Paris, who enjoyed travelling to Greece to windsurf. 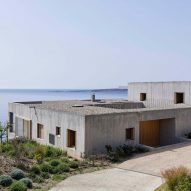 The house stands on a cliffside plot with panoramic views of the sea and windsurfers on the nearby Afiarti beach. 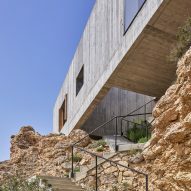 Its position on a the jagged cliff informed a design that seeks to make optimal use of its setting without disrupting the sparse and untouched natural landscape. 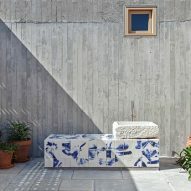 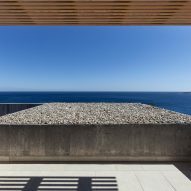 "The question became how to introduce a foreign object – a house – into this spectacular landscape, enhancing its qualities without altering its character," said OOAK. 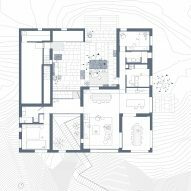 "Rather than trying to mimic the landscape, the house is gently placed on the site as an object, leaving the surrounding landscape as untouched as possible." 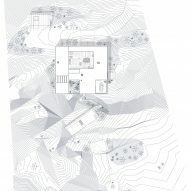 The house is designed as a distinct object that complements and enhances the rugged hillside. 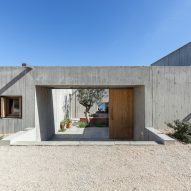 For this reason, the building is constructed from reinforced concrete with a board-marked finish, and its roof is covered with gravel that matches the tones of its surroundings. 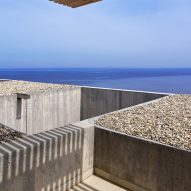 The plot features two stepped plateaus, which prompted the architects to cantilever the building from the higher ledge to optimise the views and create the impression that it extends out towards the sea. 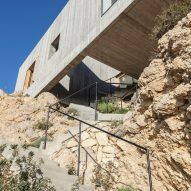 "This cantilever effect has a strong presence that augments the full experience of the site both from the inside and out," the studio added. 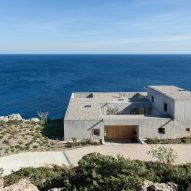 "From the inside, it creates the illusion that the house is hovering over the sea, whilst from the exterior it further accentuates the contrast between the manmade and the natural." 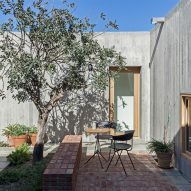 The house needed to provide usable outdoor spaces that are protected from the region's strong winds, so the main living areas are arranged on a single storey around a sheltered patio. 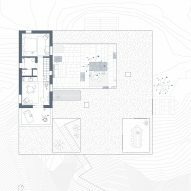 A series of voids incorporated into the structure creates a strong relationship between internal and external areas. 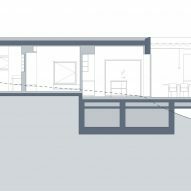 One of the voids contains a staircase leading to a large terrace on the lower plateau. 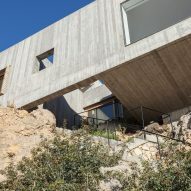 A section of the single-storey concrete form is elevated in response to a change in the site's topography. 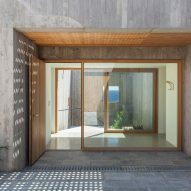 The shift in height enhances the sense of separation for the dedicated guest wing it contains. 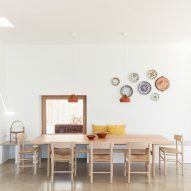 The property's bright interior combines references to traditional Karpathian architecture with Scandinavian furniture and a variety of materials. 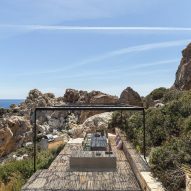 Windows distributed throughout the spaces are positioned to frame specific views of the sea and landscape. 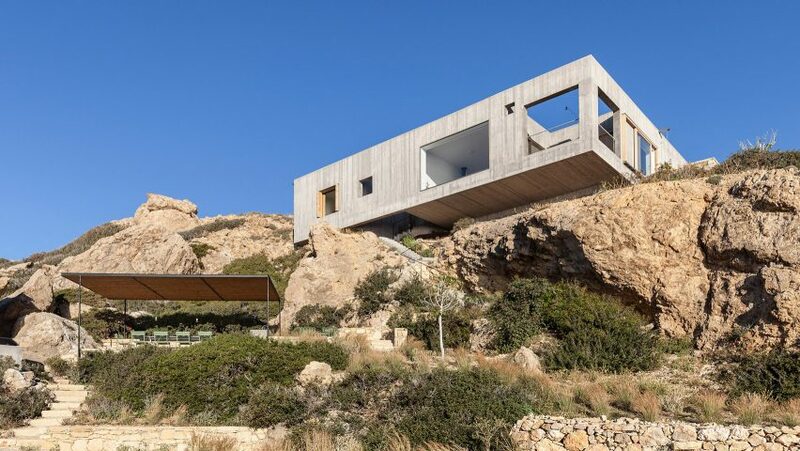 In Greece, Athens-based studio En Route Architects recently completed a linear concrete house on the hillside of the island Kea, which also has views across the Aegean Sea. 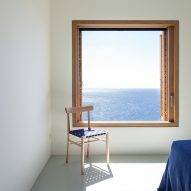 Photography is by Yorgos Kordakis unless stated.